Bio Compression Systems: Sequential & Pneumatic Compression Pumps - Spectrum Healthcare, Inc.
Bio Compression systems are comprised of an automated compression pump and vinyl sleeves (or garments) with inflatable chambers. 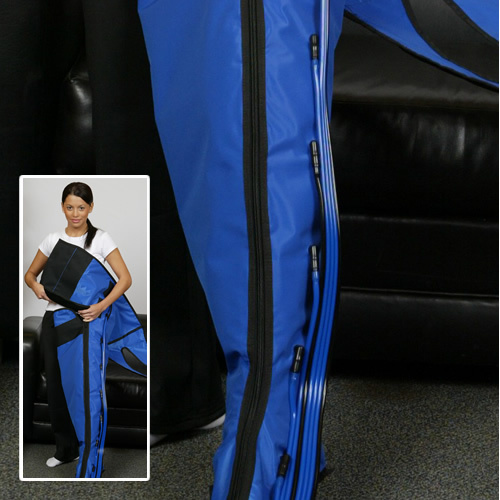 The sleeves come in almost any shape and size to fit the affected physical region (foot, leg, arm, hand, etc), and the pneumatic compression pumps range in their ability to control pressure, speed, and compression method (sequential vs. graduated). The term “pneumatic compression pump” refers to the pumps use of compressed air to inflate the differing chambers of the compression sleeve. Essentially, there are two general types of pneumatic compression pumps in terms of how they apply the compressed air inflation. They include the intermittent design, which inflates and deflates the chambers of the sleeve on a predetermined time schedule. The other type of bio compression pump is known as a sequential bio compression pump where each chamber is inflated and deflated sequentially. 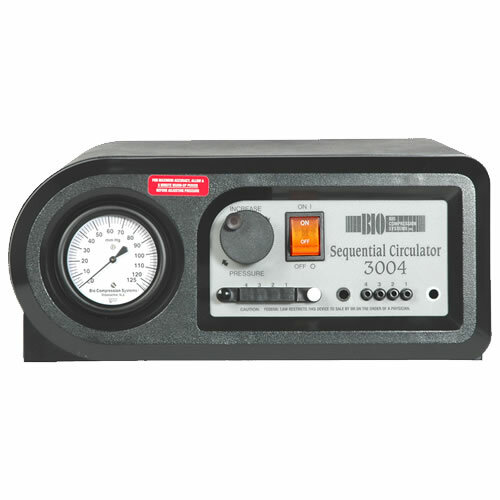 Spectrum Healthcare carries only the best quality pneumatic compression pumps and garments from all the leading manufacturers including Bio-Compression Systems, Waypoint Medical and more. To place an order, please call us toll free at (888) 210-5576. This gradient, sequential, pneumatic compression pump Model SC 2004 is intended for the primary or adjunctive treatment of primary or secondary lymphedema, and for alternate treatment of chronic venous stasis ulcers and associated venous insufficiency. It is also used for the general treatment of swelling of the extremities. 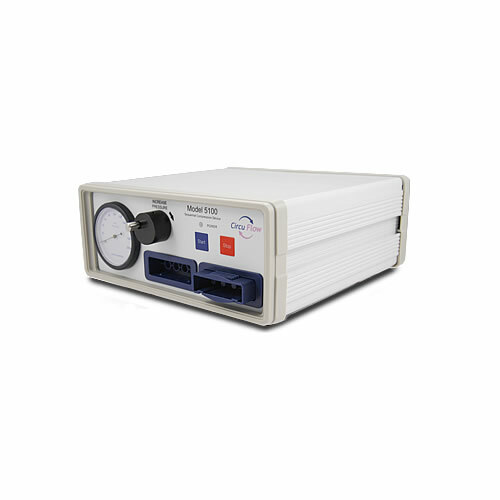 The device is intended for home or hospital use. This gradient, sequential, pneumatic compression pump Model SC 3008 is intended for the primary or adjunctive treatment of primary or secondary lymphedema, and for alternate treatment of chronic venous stasis ulcers and associated venous insufficiency. It is also used for the general treatment of swelling of the extremities. 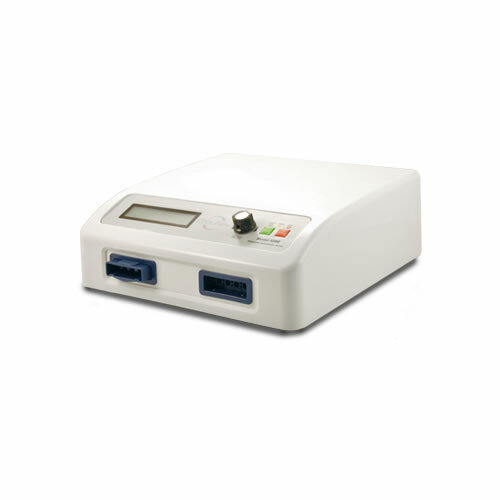 The device is intended for home or hospital use. Segmental, pneumatic compression with calibrated gradient pressure and 8 separate chambers. This gradient, sequential, pneumatic compression pump Model SC 3004 is intended for the primary or adjunctive treatment of primary or secondary lymphedema, and for alternate treatment of chronic venous stasis ulcers and associated venous insufficiency. It is also used for the general treatment of swelling of the extremities. The device is intended for home or hospital use. 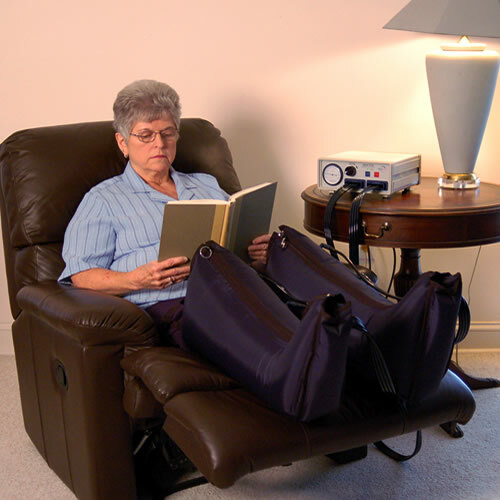 The CircuFlow Model 5100 Intermittent Pneumatic Compression Pump is used to treat chronic lymphatic and venous disorders of the lower extremities and chronic lymphatic disorders of the upper extremities. Adjustable pressure control with locking feature prevents unintended changes to the prescribed distal pressure setting. Timer mechanism provides options for the automatic shut-off of the system upon completion prescribed therapy session. Vacuum mechanism evacuates air from the garments upon shut-off of the system allowing for greater ease in the donning and doffing of the garments. 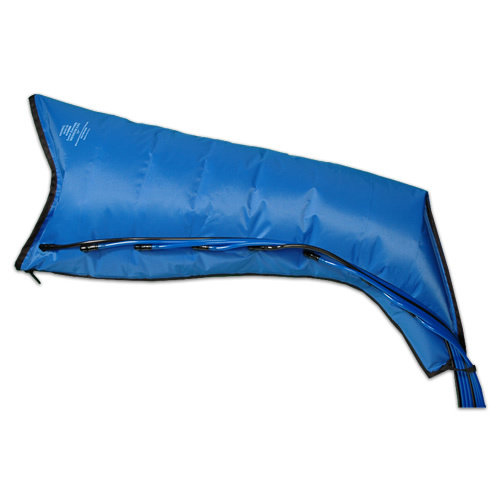 Specially designed quick-release hose connectors allow for easy removal of the garments for cleaning as needed. 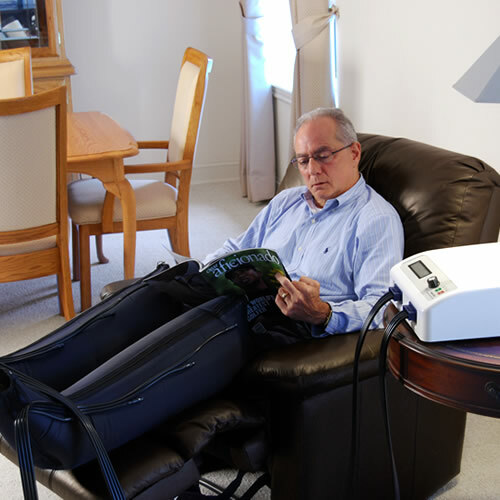 The CircuFlow Intermittent Pneumatic Compression Pump Model 5200 allows patients the freedom to treat chronic venous and lymphatic disorders in the comfort of their own homes. 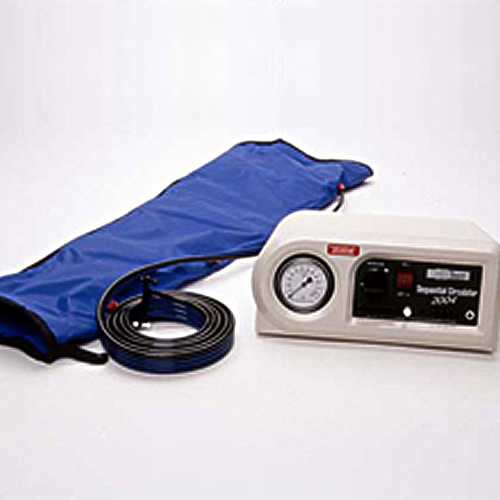 Using intermittent gradient sequential pressure applied through multi-chambered garments, the CircuFlow 5200 increases blood flow and provides extracellular fluid clearances. 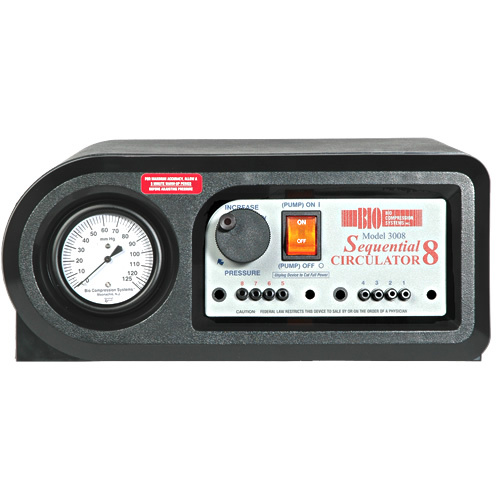 The CircuFlow 5200 can also operate in two modes: A gradient mode in which a maximum pressure and pressure gradient are administered, and a pressure mode in which each chamber's pressure can be set individually. 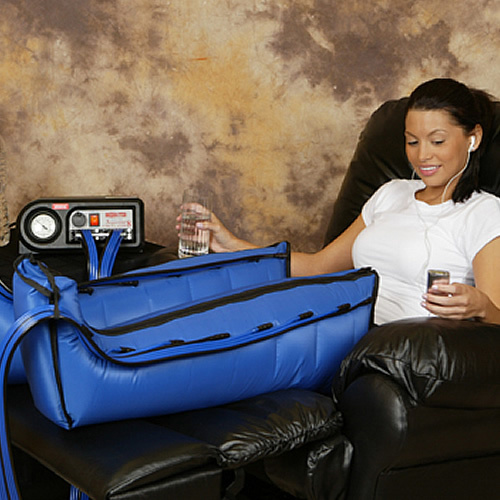 Bio compression systems are comprised of an automated bio compression pump and vinyl sleeves (or garments) with inflatable chambers. 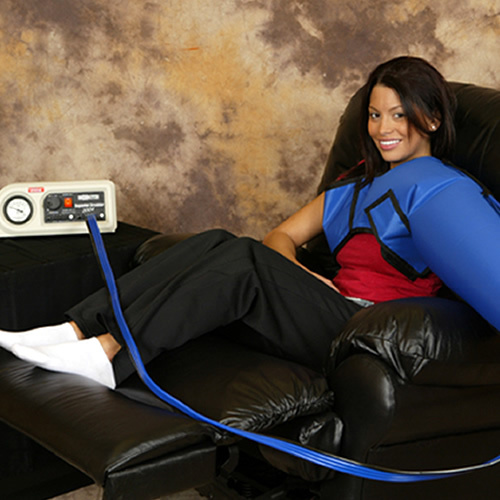 This pneumatic compression pump and sleeve are designed to force excess lymph fluid out of the limb and into central body compartments where lymphatic drainage can take place. The compression pump sleeves come in almost any shape and size to fit the affected physical region (foot, leg, arm, hand, etc. ), and the compression pumps range in their ability to control pressure, speed, and compression method (sequential vs. graduated). The term “pneumatic compression pump” refers to the pumps use of compressed air to inflate the differing chambers of the compression sleeve. Essentially, there are two general types of pneumatic compression pumps in terms of how they apply the compressed air inflation. They include the intermittent design, which inflates and deflates the chambers of the sleeve on a predetermined time schedule. Theother type of bio compression pump is known as a sequential biocompression pump where each chamber is inflated and deflated sequentially. Spectrum Healthcare carries only the best quality bio compression systems, pneumatic compression pumps and garments from all the leading manufacturers including Bio-Compression Systems, Waypoint Medical and more. 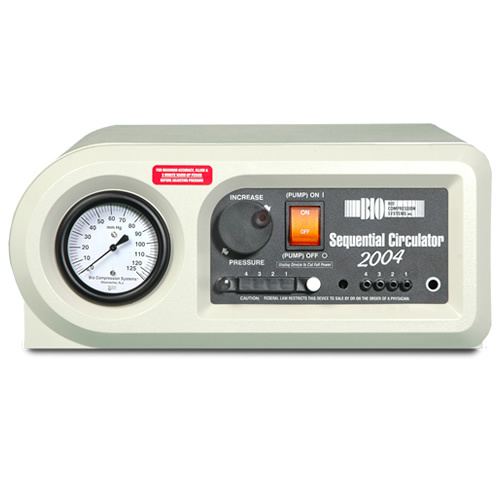 Spectrum Healthcare, Inc. provides high efficient bio compression systems and pneumatic compression pump therapy for the treatment of swelling, chronic wounds and Lymphedema. For more information or to place an order, please call us at (888) 210-5576.